KC Registered Pups World Champion Lines. Stunning. highly bred. 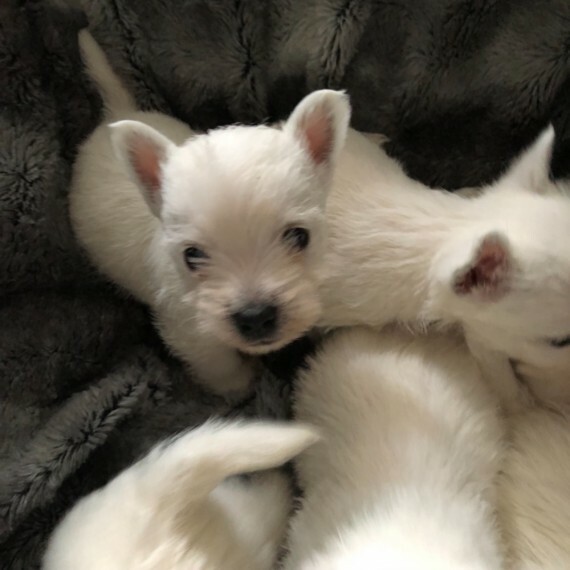 KC registered Westie pups for sale. We are proud to offer beautiful pups with numerous world champions in their bloodline. Mum alone has 25. champions .including international champions. in her lines. We are looking for pet owners only to provide loving homes for these exceptional pups. Pups can leave us from 8 weeks onwards. In order to ensure that our pups receive the best start in life they will leave us with.. 1st vaccination and full vet health check. Microchipped. Flea and worming treatments up to date. 4 weeks free insurance. to provide piece of mind for the new owners. Puppy starter pack. KC papers. Comprehensive after care also offered. Mum and dad are household pets and are available for viewing at all times. Adopting, or buying a new puppy or dog is an important decision and big responsibility. As an owner, you will solely responsible for the welfare of your new pet and will also be financially committed. Before you decide to buy or adopt you must ensure that you’re 100% committed beforehand. For further information on caring for puppies and dogs, please visit our pet advice section. You can also find out more information about the West Highland Terrier breed by visiting the West Highland Terrier Dog Breed Information.